It's almost here, that madness that descends on our town during that month long frenzy between Thanksgiving and Christmas. To explain... Queensville Michigan was, in my youth, kind of sleepy. I went to college away - in Canada, actually - but came back and found that in the few years I was gone (I came back often, but it's not the same as living here) my town was transforming. It started when a few out-of-towners moved here and started businesses; the Knit Knack Shack and Jewel's Junk, to be precise. Then bed-and-breakfast establishments opened, two in one year. About that time the town's heritage society got going, and they started the May 'Tea with the Queen' event. Queensville was becoming a tourist town. I've always thought we're in the middle of everything... close to so much, the lakes and beaches, not far from Cedar Point, close to Frankenmuth, and a lot more. And now, just in the last year the heritage committee has kicked it into high gear, there is another new vintage and antiques shop in town, Cynthia Turbridge's The Cottage Shoppe, and another that may open in the near future even though I am sworn to secrecy by someone I care about a lot! Whew!! I'm on the heritage committee and I've been given the awesome task of designing the vintage kitchen in what will become the Queensville Historic Manor, to be open in time for the town's latest festival started just a couple of years ago, Dickens Days, which kicks off in December! So much change... I guess I feel a little jumbled because of everything that has happened in the last few months and even my personal changes. I went from having a steady live-in boyfriend (Joel Anderson, now engaged to someone else!!) to dating a multi-millionaire in just months. And then there are my growing physical feelings for a hunky police detective, even though I just can't see us together. Zack is goodlooking, and nice, but... his mind just seems to be elsewhere. We're so different and I'm afraid we want different things in life. And then there are the murders; that sounds so ominous, but we've figured out what happened in each. Anyway, you'll just have to catch up with all the love and murder in the latest recounting of my life, No Mallets Intended! But... do you ever feel like your life is moving so fast, you can't catch your breath? What do you do to slow it all down? Surprise giveaway today... comment here to enter to win. 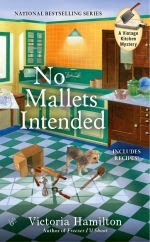 I'll be giving away a Cozy Up With A Good Mystery tote and a copy of No Mallets Intended!! Jaymie Leighton is excited and a little nervous about her current big venture, completely redoing the kitchen at Dumpe House—now the Queensville Historic Manor—in time for the December opening. But the house is mired in controversy, a challenge to the heritage society’s right to own it, and questions about the author hired to write a pamphlet detailing the Dumpe family history and that of the house. None of Jaymie’s business, so she keeps her head down and her focus on the exact color right for the kitchen, and assembling all the accouterments, including a Hoosier cabinet! She’s also got lots to think about in her personal life with Daniel acting a little odd, and her friend Heidi dragging her in to the trouble between her and her fiancé, Jaymie’s former boyfriend Joel. But a late night whack on the head with one of the antique mallets Jaymie has been cataloging for the society and a dreadful murder right on the house’s doorstep draws her once again into murder and mayhem. Jaymie faces her most cunning and dangerous opponent yet, but with Valetta by her side and the police chief’s approval, she must figure out whodunit before they do it again! I can't wait to read No Mallets Intended! Looking forward to making whatever recipes are in the book as well. :) Cute kitty, by the way! Can't wait to read this one. To slow things down, I do a lot of walking outdoors, and a lot of reading curled up with my cat. I love this series so much! I would love to design a vintage kitchen! I have vivid memories of both of my grandmother's kitchens. One grandmother had a really old black stove that was so much prettier than the new white one that replaced it. Both had country sinks with little curtians around the bottom to hide the slop bucket! And one of them had hand pump right at the sink. She never had indoor plumbing! I love the series. Just finished reading the last book. Vintage anything for me so these books are right up my alley. Daisy(my senior shih tzu) and I love to curl up and read. I adore kitchen vintage and when I found this series, became a loyal reader of yours! Can't wait to read this book! Ever since I started reading this series, I find myself fascinated with vintage kitchens, dishes, linens and cookbooks. Thanks Jaymie. Great minds think alike! My first thought when seeing the picture was, "Wow. The cat is included?!" But my three cats ( not My Three Sons) would probably not appreciate the extra cat. The bag they can crawl into and the book means I'm sitting still and creating an available lap. That would be a-ok.
Love this series. And since I am retired life moves at a pace that is fine with me. Looking forward to reading this installment. 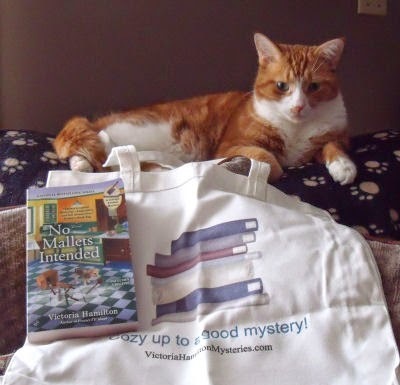 I loved the picture of the beautiful cat with the giveaway items! The description of the book sounds delightful. Please enter me in the giveaway. Too bad the cat is not included, too!!! But it's a great prize even catless. Very timely post. I retired this past March and sometimes I feel like I should go back to work so I have some free time! Something always seems to pop up, doesn't it? During the holidays to slow things down I try to stick to what is really important, and sitting down for a while with a good book helps too. Thanks for the giveaway. Great series!!! Would love to win! I would love to read this book—thanks for the very generous giveaway! No need to enter me in the contest since I've already read the book on my Kindle. I just wanted to say that I loved it!! Not just the twists and turns, but, most importantly, the great character development. Great series! Looking forward to it! My answer as a senior citizen to everything is NAP! Looking forward to the latest in a terrific series. Love your books and would love to have this one. As a fellow kitchen collecter I would love to win this giveaway! I make my favorite cup of coffee (vanilla) and then plop down in my favorite cushy chair with a good book and get lost in the writer's world. Well shoot! Thought that cutie patootie cat was part of the prize package...lol! Thank you for such entertaining reads. I love the security cat who is guarding the goodies for the giveaway. Thanks for sharing your fur baby with us. Can't wait for the next book. I read to keep things in my life at an even keel. Book looks good. I love the recipes! Come for the mystery, stay for the recipes!!! Looks like a really awesome series, I look forward to reading it! THanks for the chance. I would love to have teh cat included, but I do have three of my own. Thank you so much, everyone for entering. I've emailed the winner! I appreciate each and every one of you, and so does Poodle the Cat! Lovely prize. Thank you for a fabulous cozy series that is one of my very favorites! Haven't read any yet, but love new authors I haven't read and these look awfully good. I would love a copy of this cozy. Your blog is one of the best that I follow. Oh. This sounds like one I would really like.